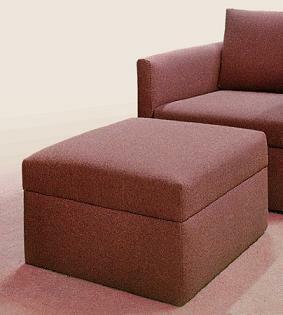 Our ottomans, especially in larger sizes, are often used to serve many purposes, not only as a footrest but also as (1) a coffee table, (2) short term seating for extra people, (3) a sleeping surface when placed at the end of one of our armless or one-armed loveseats, or (4) the equivalent of a chaise longue when placed in front of a chair or sofa. This chaise-equivalent has the major advantage over a normal chaise in that you can easily move the ottoman around your space to meet the needs of the moment, to serve as an extra seat or a coffee table. For various reasons, we normally make these the same height as our standard seat height (about 16 1/2"). Some people might prefer a lower height for greater comfort as a leg rest, and we can certainly make them that way (at no additional charge when ordered with a sofa, loveseat or chair). We can also make them higher for an additional charge. 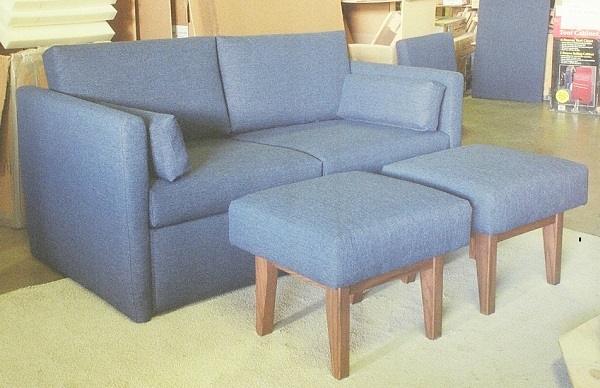 At left: 18 x 20 ottoman with standard, narrow tapered legs. On right: 18 x 20 ottoman with 440 Series legs. Above: 24" x 38" ottoman with wider tapered legs (with OQLOD -FSY 7 fabric from Williams and Sherrill). 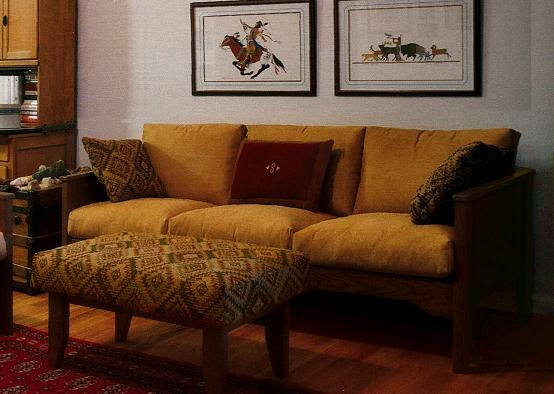 People sometimes choose a contrasting fabric for an ottoman, as shown above. See how well one of our larger ottomans can serve the purpose of a coffee table or also be used for a chaise setup. The main difference between a sofa or chair with one of these and a chaise longue is the greater flexibility you get with one of these. Our fully-upholstered ottomans can also be made in any fabric and in many different sizes. Prices are shown at the bottom of this page. As opposed to one larger ottoman, separate ottomans allow greater individual adjustment to personal preferences of different individuals sitting side by side. They are also a little more convenient to move around (but also more expensive than one large ottoman with the same top surface area).On left: 67" Custom 05 loveseat with two 18" x 20" ottomans with narrow tapered legs. To a certain extent, one of our ottomans in front of your chair or sofa seat can even serve the purpose of a recliner if you combine it with a pillow at the rear of the seat and a pillow (leaning against the wall behind) for a headrest. There is a good reason why we don't offer normal recliners: According to our research, durability is a serious problem for recliners, even for manufacturers who make them as a specialty. You should look very carefully at the warranty that comes with any recliner you're considering. A close reading will usually reveal that, if you have structural problems, there is little chance of getting a remedy that wouldn't cost you more than the product is worth. You'd normally have to return it to the factory or distribution center at your expense, and then the manufacturer can decide whether the problem resulted from a "defect in materials or workmanship" or from something else (such as normal wear and tear). If they decide the latter, their warranty would not apply. Also, call a trucking company and find how much it would cost you to ship it to the distant destination (many hundreds of dollars each way), after you have somehow packed it for shipping. Not to mention the likelihood of damage in shipment, which would be a matter between you and the trucking company. So, if you're concerned about durability and long-terms costs, relaxing with one of our ottomans along with a headrest pillow and a lower-back pillow (instead of buying a recliner) should be very appealing to you. The flexibility of also using the ottoman as an extra seat and as a coffee table would be icing on the cake. With the narrow tapered legs or in the fully-upholstered model, the basic prices are $460 in the 18" x 20" size (shown above), $540 for the 24" square size, $610 for the 27" square size, or $720 for 24" x 38". The surcharges for fabrics (fabrics that are above the base price) for the ottomans with exposed-wood legs are (for the above sizes) as follows, respectively: $4, $5, $6 and $7.For the fully-upholstered models, the fabric surcharges for the respective sizes are $9, $12, $15, and $17. Ottomans with the 440 Series legs (as shown in the middle picture near the top of the page, above), or with the wider tapered legs (as shown in both pictures on the right, above), the pricing is $530 plus $4 per fabric "+" level for the 18" x 20" size, $595 plus $5 per "+" level for the 24" square size, $720 plus $6 per + level for the 27" square size, or $850 + $7 per "+" level for the 24" x 38" size. The above prices assume our normal 5-6 week order completion time, but we offer a 10% discount off the base price if you're willing to wait six months, which helps us to plan our production more efficiently. We do not charge sales tax on orders shipped via common carrier to points outside Virginia.